Silence is a beautiful, complex mix of Good Friday and Easter Sunday. There's an old story that one of Martin Scorsese's New York University professors said his films contained too much GoodFridayand not enough EasterSunday. It turns out,as Scorsese toldAmerica Magazine, the remark was uttered by Rev. Francis Principe in reference toTaxi Driver, and goes like this: "I'm glad you ended it on EasterSundayand not on GoodFriday." A story that examines the profundities of faith,Silencehas EasterSundayand GoodFridayrunning through it. It's a quieter Scorsese movie (though not too quiet; there's enough gore to go around). Its central question is open to interpretation: Why is God silent in the face of human suffering? In the 17thcentury, Father Ferreira (Liam Neeson), a Portuguese Jesuit priest, watches in horror as his fellow Jesuits are tortured. Eventually, we end up back in Portugal in the offices of Father Valignano (Ciarán Hinds). He's explaining to Fathers Rodrigues (Andrew Garfield) andGarupe (Adam Driver) that Ferreira, their mentor, is an apostate, having renounced Christianity.Rodrigues andGarupe want permission to go to Japan—where practicing Catholicism has been banned—findFerreira, bring him home and preach to the converted, if they find any. Valignano doesn't resist much, despite reports that priests are dying in large numbers. Soon Rodrigues andGarupe are recruiting Kichijiro (Yôsuke Kubozuka), a Japanese sailor and a drunk, to aid them once they get back to Japan. Kichijiro lives in a state of constant self-recrimination for adopting Christianity, then abandoning it to save himself while his family was burned alive at the hands of samurai purging the shores of anything not resembling Buddhism. When the Jesuits arrive in Japan, an underground Christian community greets them as heroes.Rodrigues andGarupe are soon saying Mass in Latin and hearing confession, with difficulty, in Japanese. Soon other Christians come looking for them, and that brings fresh scrutiny from the local authorities. Rodrigues andGarupe split up in an effort to keep hidden and locate Ferreira. An inquisitor named Inoue (Issey Ogata, whose performance is simultaneously benevolent and malevolent, and therefore terrifying) tortures and kills several locals before capturing Rodrigues and giving him a choice: Apostatize, or watch your followers die. It's here thatSilencetakes a contemplative turn, going from what is essentially a subdued cat-and-mouse thriller into full-blown philosophical head-scratcher. An interpreter (Tadanobu Asano) for Inoue makes the point that the Portuguese Jesuits have come to Japan in bad faith. How can the local authorities treat the Jesuits with respect if the priests don't respect the Japanese enough to learn their language? Rodrigues is taken aback. He's met someone who's at least as smart as he is, and he's not even the inquisitor. Rodrigues suggests that it's the Japanese who are acting in bad faith—that the soil in Japan is rotten if it doesn't allow the seed of Christianity to bloom. There's a lot of back and forth like that between Rodrigues, the interpreter and Inoue. It's a pleasure to watch Ogata contort his face in myriad ways as he hears Rodrigues answer his questions in exactly the same fashion as other Jesuit priests. And as Inoue tortures Rodrigues' followers, it becomes clear he doesn't enjoy it. As he puts it, the Japanese people and its government have very different ways of viewing the world from the Jesuits—but he's not going to blink before Rodrigues does. Silenceisn't without its problems. Kichijiro keeps showing up and making things better or worse as the plot demands; if there were ever a character you'd want to punch in the face, it's this guy. Ferreira's explanations for his decisions don't quite ring true (though maybe that's the point), and Driver's accent goes as quickly as it comes. But the cinematography is beautiful, the bulk of the performances stellar and Garfield deserves some kind of award for playing Rodrigues and Desmond Doss inHacksaw Ridgein the same year. 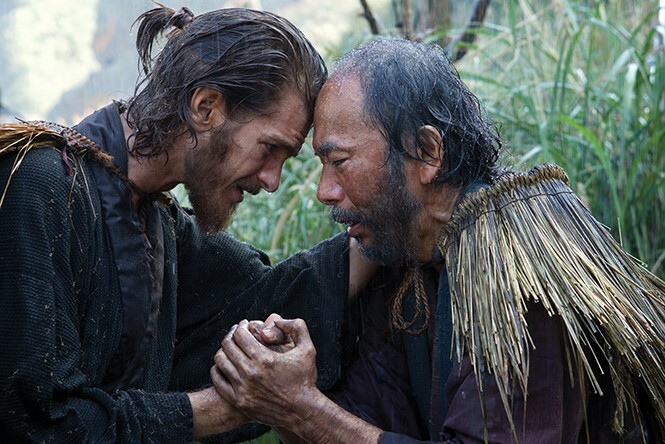 Ultimately, Scorsese puts forth no answer to the question of God's silence; that would be pretty bold.Silencewill probably feel like a reaffirmation of Christian faith to some and an impugnation of Christian arrogance to others. Whether it's a Good Fridaypicture or an EasterSundaypicture likewise is open to interpretation. The movie's final shot is one big question.